The Jaguar I-PACE eTROPHY racecar charged ahead as it made its global debut in Berlin this past Saturday. 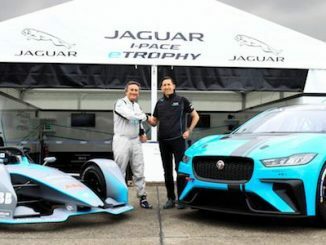 Founder and CEO of Formula E Alejandro Agag had the honor of marking this historical moment alongside Jaguar Racing as he drove the racecar around the iconic Tempelhof Circuit. Alejandro Agag put the eTROPHY racecar through its paces on the track and completed five laps in front of the crowds in Berlin. While demonstrating its dynamic capabilities, the eTROPHY racecar gave a glimpse of the future of the ABB FIA Formula E Championship to a global audience. Jaguar Racing has announced its first Jaguar I-PACE eTROPHY partner, with Michelin joining as official tire supplier ahead of the series debut season later in the year. 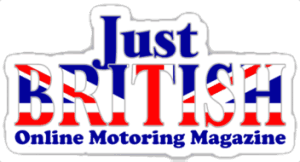 During an on-stage appearance at Autosport International, Jaguar Racing Team Director James Barclay revealed that leading motorsport tire supplier Michelin will provide tires for all 20 Jaguar I-PACE eTROPHY racecars at each round of the world’s first international championship for production-based electric cars. Jaguar Racing announced the first Jaguar I-PACE eTROPHY race team for its new global electric racing series. Rahal Letterman Lanigan Racing, led by Team Principal Bobby Rahal – three-time IndyCar Champion and Indianapolis 500 winner – will join the grid in the world’s first production-based electric vehicle race series, starting in December 2018. The Jaguar I-PACE eTROPHY is a support series to the FIA Formula E Championship and the first to be based on a street-legal production battery electric vehicle. Races will take place the same weekend, and on the same city street circuits, throughout the 2018-19 season. The series, which will exclusively feature 20 Jaguar I-PACE eTROPHY race cars, offers teams the chance to showcase driving talent and electric performance while competing on the world stage in zero-emissions motorsport. Jaguar Land Rover has unveiled the Jaguar I-PACE race car that will compete in a pioneering single-make series supporting the FIA Formula E world championship. 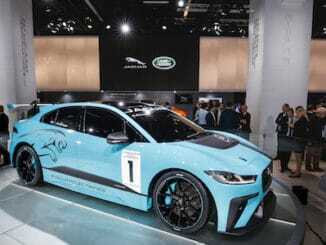 The electric racer is based on the Jaguar I-PACE – the world’s first premium, performance, all-electric SUV that launches next year and is already a hit with customers around the globe placing their deposits. The new Jaguar I-PACE eTROPHY series will join the Formula E circuit in 2018. After becoming the first premium manufacturer to enter Formula E in 2016, Jaguar has created eTROPHY, the world’s first production battery electric vehicle race series. The Jaguar I-PACE eTROPHY will be the support series for the FIA Formula E championship, taking place on the same weekends at the same city circuits, starting in late 2018.